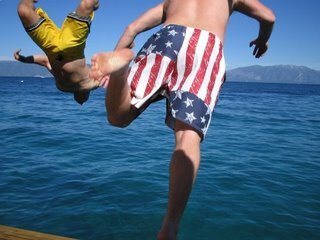 The picture to the left is of me (in the flag shorts) jumping for joy in to beautiful Lake Tahoe from the sheer delight created by the great bottle of Lichido that was recently sent to me. I had also had enough of it to keep me warm in the snow runnoff that is filling the lake right now. 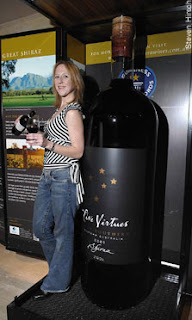 The bottle is large, gorgeous, and worth every single penny of the US$22.99 that they're expecting to charge everyone. I brought this bottle out to much questioning at our Fourth of July party and went on to mix it in a shaker with a decent vodka (Smirnoff Triple-Distilled) for some Lychee-tini's. The questions were just as much around the color (a nice light peach color) as they were around the bottle itself. One taste quickly put all doubts behind us as the drink was unanimously declared a success. The gentle and subtle flavors of peach and lychee were warm and created a hint of sweetness without being overpowering in any way. I took a shot by itself and was able to discern the cognac flavor a lot more than when it was mixed and it lended itself to being perfect by itself as a sipping shot or with ice in a scotch glass. Lichido has become my new favorite drink in my bar and can be mixed with a lot of things, though I found the best for me was the Lychee-tini. I used a sprig of mint for the garnish and it created a nice contrast to the subtle color of the Lichido. If you can find a Lychee for garnish, all the better. Whatever you do, find this bottle and order it or pick it up. If you're looking for a new drink and something with excellent uniqueness, you'll get it all in this bottle. I'm not a big fan of mixed drinks but this stuff is amazing. Great review. Excellent new product.